AQUATIC PLANTS: Bring your pond to life with thriving, beautiful, exotic aquatic plants! 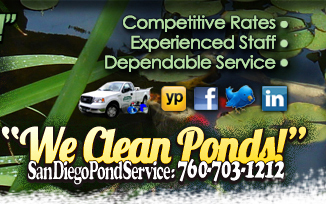 San Diego Pond Service specializes in aquatic pond plant mgmt. 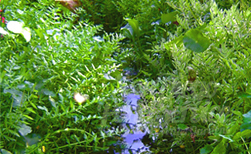 Aquatic pond plants are essential to maintain optimum water balance. They provide an excellent source of oxygen to the pond, give coverage and shelter to your koi, can be used to redirect water flow, fight algae, and are a necessary component in the nitrogen cycle. If you do not have an ultraviolet sterilizer added to your filter system, we strongly recommend using a variety of aquatic plants in your pond to help prevent single cell (green water) algae blooms. 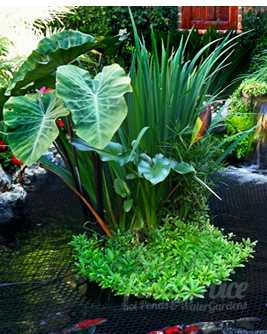 Pond plants such as lilies, lotus, bog plants, and various types of floating plants, all look great in your pondscape. Without plant care, your beautiful pond plants can quickly take over your entire pond causing harm to fish, pond imbalance, structural damage, and even leaks. Dead foliage needs to be removed, roots should to be tended to, and routince repotting and fertilizing needs to occur to maximize seasonal bloom yields. SEASONAL POND PLANTS: When choosing aquatic plants for your pond, keep in mind that many pond plants go dormant during colder winter months. However, there are some aquatic plants that thrive in cooler temps. Combining summer and winter seasonal plants will guarantee pond blooms all year long. Pond plants can grow rapidly. qdd plants that are appropriate for your pond size. Need help? We love aquatic pond decorating and can get your swamp looking pond-tastic! We know how to keep your pond beautiful year-round.